Blind Beach, Jenner, CA After a rainy MLK weekend, my photo trip was redeemed with a brilliant sunrise over Blind Beach near Jenner, CA. 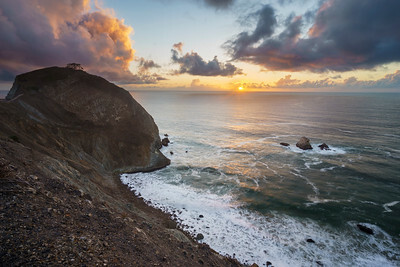 This image required blending two exposures: one for the bright sunrise clouds and sky and another for the dark hillsides and the beach in the shadows. MacKerricher State Park, Mendocino, CA As a brilliant sunset enfolded before me, I noticed this peculiar looking tidepool that - at the right angle - looked like a dolphin. Setting my tripod so the sunset light reflected in my new dolphin friend, I snapped this shot with a 3-stop graduated neutral density filter to balance the bright sky against the dark foreground. 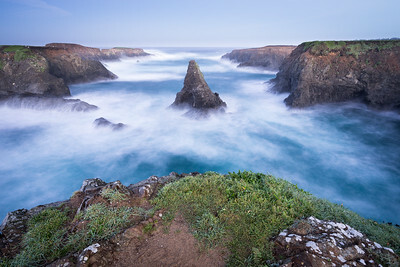 Mendocino Headlands, CA The turquoise waters of the Mendocino Headlands blur under a long-exposure during a pre-dawn photoshoot. The sunrise brought some color to the sky, but nothing beat the mystery contained in this long-exposure shot. Mori Point, Pacifica, CA On a spring shot of the wildflowers I noticed this rock maze on the bluffs near Mori Point in Pacifica. 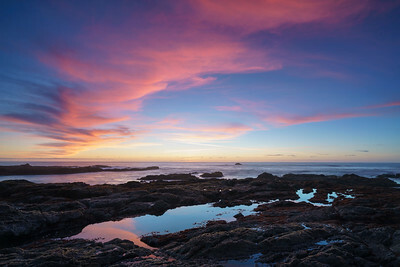 It was the perfect foreground for the glory of the sunset that shortly unfolded, with the famous San Pedro Point along the horizon. Pacifica, CA The town I live in, Pacifica, CA, is typically socked in by fog every summer day. However, the winters bring clear air and wonderful light as storm systems move in from the Pacific. 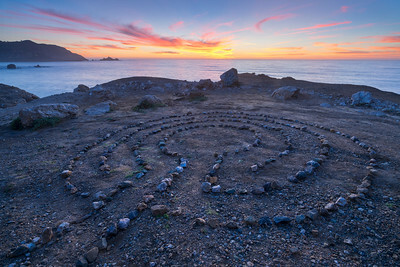 This shot was taken on the "Devil's Slide", an old section of Highway 1 converted into a hiking trail. 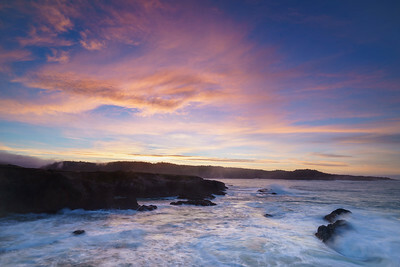 Mendocino, CA January brings dramatic sunrise skies to the sleepy Northern California town of Mendocino. 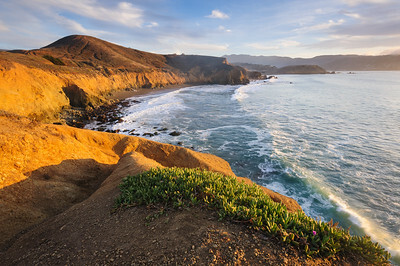 The town features miles of hiking along the bluffs known as the "Mendocino Headlands", a California State Park. Interestingly, loggers used to load redwood trunks in these rugged coastal waves onto boats to ship down to San Francisco . Salt Point State Park, Sonoma County, CA A lovely little gem that few know about, Salt Point State Park features incredible sandstone formations along the beach. 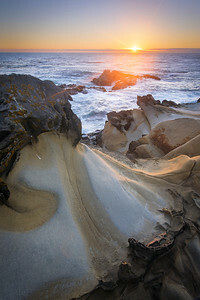 I used the curvature of this sandstone slide to draw the viewers eye into the image, towards the setting sun. 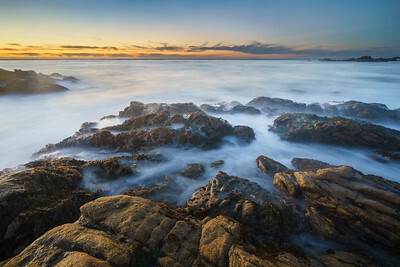 Salt Point State Park, Sonoma County, CA I love shooting coastal images after the sun has set, using long exposures (~15-60 seconds) in the near-darkness to draw out all the beautiful light our eyes can barely see. 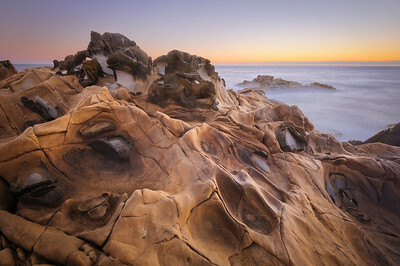 This is an instance of such a technique, turning the ocean waves into cloud like blurs behind the surreal sandstone formations of Salt Point. 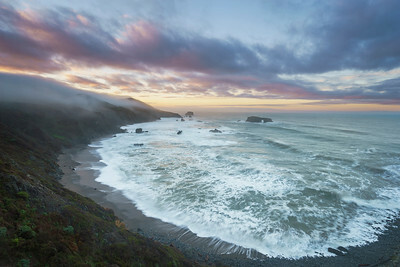 Redwood National Park, CA The last stop on my three week "Great Mega Western Photo Tour", I arrived in Redwood National Park as the sun set behind a massive grey cloud. 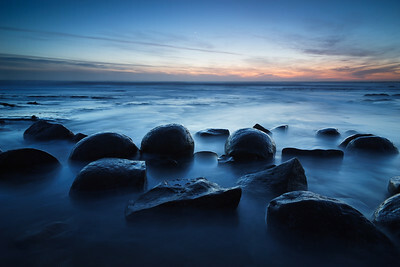 Seeing a sliver at the horizon, I framed this image of "footprints" in the rocks. I waited for the sun to briefly break through, which it finally did, illuminating the footprints in warm light and the sky in a purple glow. 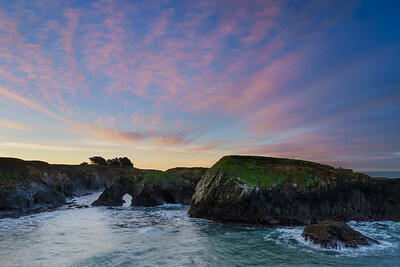 Mendocino Headlands State Park, CA One of my favorite places to shoot on the California coast, especially in January when clouds create dramatic sunrise and sunset light, the Mendocino Headlands features miles of coastal trails and dramatic rock formations. This sunrise was serene as I listened to the waves crash along the coast. 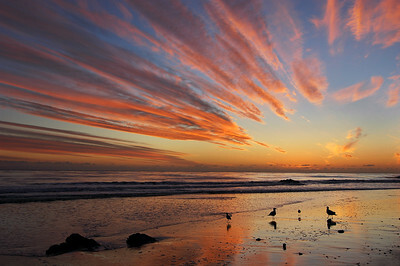 Santa Barbara, CA During college at UC Santa Barbara, I lived 2 blocks from this beach and used to walk along it during sunset with my camera. This serendipitous shot caught my eye one spring evening as three shorebirds gathered underneath the converging clouds lit up by the setting sun. Point Lobos State Park, CA A long exposure blurs the ocean waves crashing over the coastal rocks of Point Lobos State Park. Mori Point, Pacifica, CA Wildflowers abound on the bluffs near Pacifica's Mori Point in a springtime sunset. This year featured an especially great rainfall in Northern California, which led to a wonderful display of coastal wildflowers. Mori Point, Pacifica, CA Bountiful winter rains brought an incredible harvest of wildflowers to Mori Point, blanketing the coastal bluffs with an explosion of color. 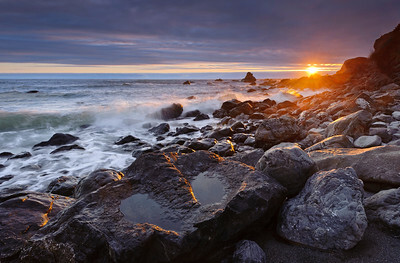 Sonoma Coast, CA A famous spot for photography on the Sonoma Coast, Bowling Ball Beach features large boulders that can only be seen at certain tides during the month. MacKerricher State Park, Mendocino Coast, CA The tideepools at MacKerricher State Park are full of life: sea anemones (like this one), sun stars, sea slugs, and even octopus. 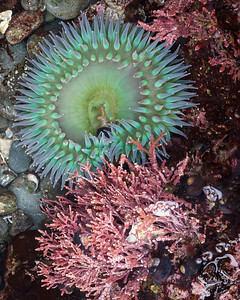 However, it takes quite the hunter to find a beautiful and large open anemone like this one. Point Lobos State Reserve, Monterey, CA Point Lobos is a lovely coastal park south of Monterey, CA. 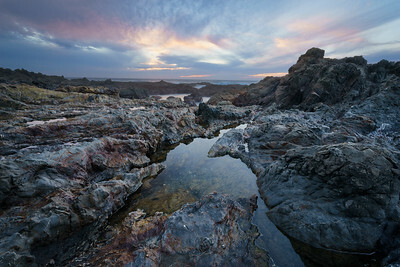 This image was taken during a clear winter sunset as the last light lit with mossy coastal rocks in a warm glow. 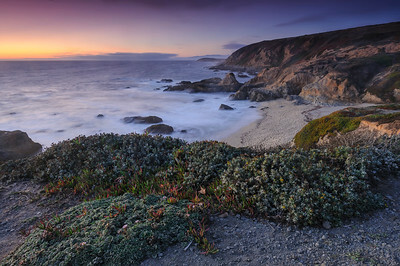 Near Bodega Bay, CA Twilight sheds its warm purple glow into the skies above the Sonoma coast, near Bodega Bay. 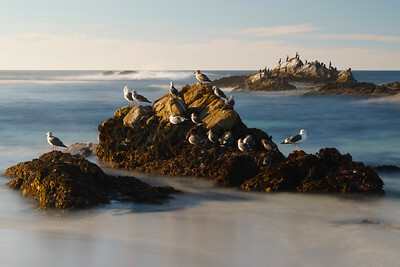 Point Lobos State Reserve, Monterey, CA A group of seagulls pose patiently for a long exposure shot, blurring the waves on the coastline of Point Lobos State Reserve. 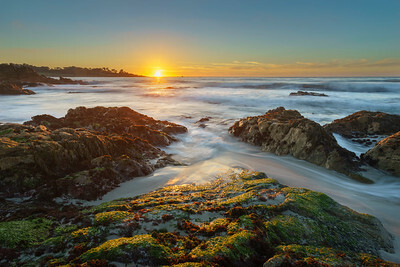 A "neutral density" filter was used to obtain a very long exposure in the afternoon light to create such a dreamy blur of the ocean waves. 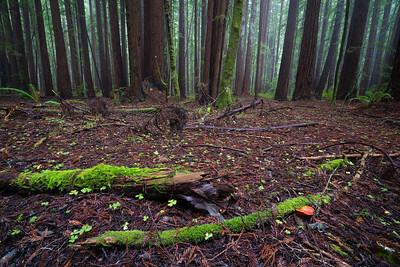 Armstrong Redwoods, Sonoma County, CA A lone mushroom grows in the damp forest floor of Armstrong Redwoods park in Sonoma County. I perched low to the ground to snap this image of the mushroom while maintaining the wonderful symmetry of the trees surrounded by fog. 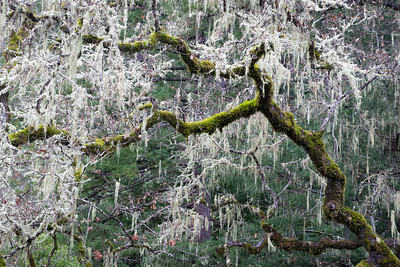 Armstrong Redwoods, Sonoma County, CA Moss grows on and off a tree in the hills of Armstrong Redwoods park. Mendocino Coast, CA The sun sets over a tidepool in MacKerricher State Park on the Mendocino coast. I perched my tripod very low to get the perspective seen here, which draws the eye into the scene, towards the colors in the sky. Mori Point, Pacifica, CA December sunset light paints the hills of Mori Point in a golden hue as the waves of the Pacific crash along the beach. 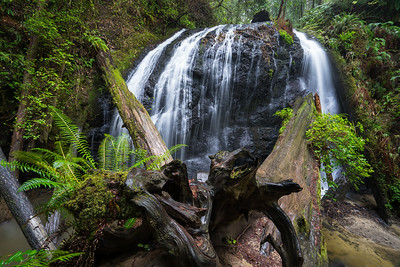 Mendocino, CA After a 7-mile hike into the Mendocino forest, I was greeted by this vigorously flowing waterfall, which I photographed gratefully, albeit with an umbrella taped to my tripod to prevent the constant rain from falling on my lens. 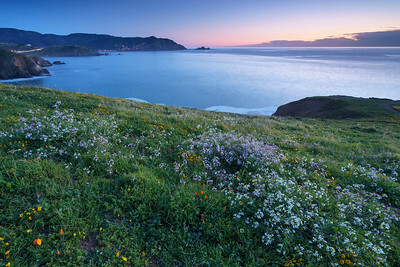 Wildflowers abound on the bluffs near Pacifica's Mori Point in a springtime sunset. 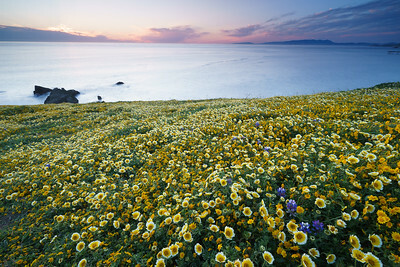 This year featured an especially great rainfall in Northern California, which led to a wonderful display of coastal wildflowers.